Sidney’s Andre Gordon dunks during a nonconference game against Wapakoneta on Monday in Sidney. Gordon finished with 42 points and became the school’s all-time scoring leader. Sidney's Jace Conrad tries to keep the ball inbounds as Wapakoneta's Aaron Good defends during a nonconference game on Monday in Sidney. Sidney's Lathan Jones puts pressure on Wapakoneta's Noah Ambos during a nonconference game on Monday in Sidney. Sidney’s Jace Conrad passes while covered by Wapakoneta’s Aaron Good during a nonconference game against Wapakoneta on Monday in Sidney. 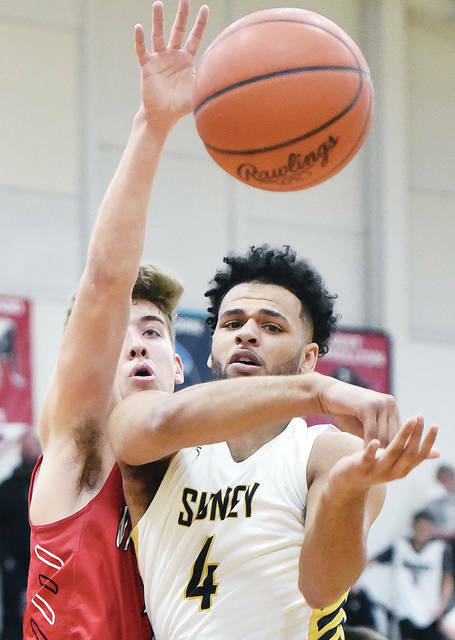 Sidney's Darren Taborn looks to get around Wapakoneta's Aaron Good during a nonconference game against Wapakoneta on Monday in Sidney. Sidney's Josiah Hudgins shoots as Wapakoneta's Noah Ambos defends during a nonconference game against Wapakoneta on Monday in Sidney. Sidney's Darren Taborn scores a layup during a nonconference game against Wapakoneta on Monday in Sidney. Sidney's Andre Gordon dunks during a nonconference game against Wapakoneta on Monday in Sidney. 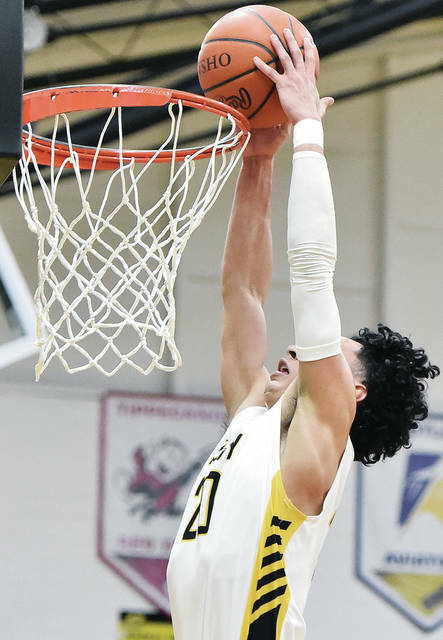 Sidney's Andre Gordon puts the ball between his legs during a dunk attempt during a nonconference game against Wapakoneta on Monday in Sidney. Andre Gordon makes a behind the back slam dunk during a nonconference game against Wapakoneta on Monday in Sidney. View more photos of Wapakoneta at Sidney here. 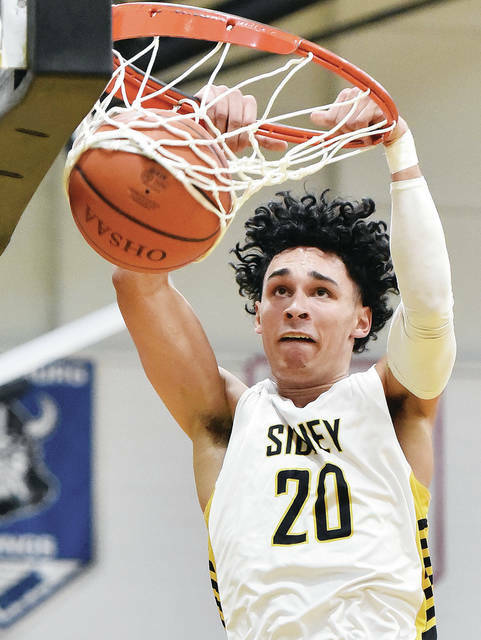 SIDNEY — Andre Gordon finished his ascension as the best basketball player in Sidney history on Monday. 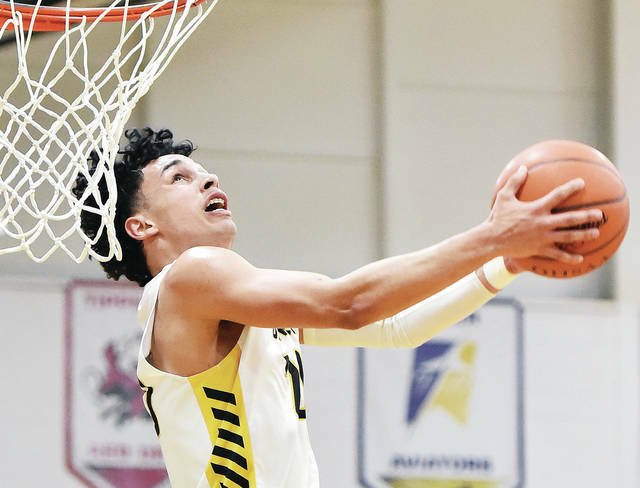 Gordon scored 42 points and became the school’s all-time career points leader in a 65-61 nonconference win over Wapakoneta, which pushed the Yellow Jackets’ record to 12-3 overall. Gordon matched and surpassed 1988 grad Dewayne McCluskey on a pair of free throws with 1:16 left in the third, after which play was stopped to recognize the feat. He posed for pictures with family and was presented with the game ball, which he jokingly said he’d sleep with on Monday night. After Monday’s game, Gordon has 1,761 career points. McCluskey finished with 1,745. Gordon, a senior point guard who signed with Virginia Tech last November, became the school’s all-time career assists leader last season. He’s likely to surpass 500 career assists later this season. 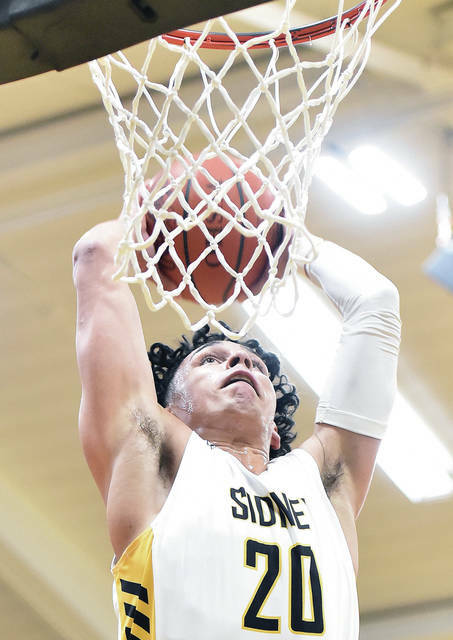 “You’ve got to shoot the ball and shoot it well and have teammates and coaches that are acceptable to that (to reach a scoring mark like this),” Sidney coach John Willoughby said. “It’s not that Andre comes out and overdoes his shooting. If anything, he probably doesn’t shoot enough. Gordon, who had four dunks Monday, has scored 40 or more points four times in his career and 30 or more points 15 times. Ratez Roberts also surpassed 500 career rebounds in Monday’s game. He already has become the program’s career rebounds leader. Monday’s game was the first of five in the next week for the team and a bounce-back win following a late collapse in a GWOC crossover loss to Trotwood-Madison last Friday. Gordon scored 10 points in Friday’s loss. Sidney led 32-27 at halftime. The Redskins (11-5) used a 6-0 run in the middle of the third quarter to pull within 40-39 with 3:35 left. Darren Taborn made a basket with 1:53 left to boost the lead to three, then Gordon added four foul shots before the end of the quarter to stretch it to 46-39. Gordon hit two 3-pointers and made a basket in the first minute of the fourth to push the lead to 53-42. The Redskins pulled within six points midway through the quarter, but Keith Lee scored a basket and Gordon had his fourth dunk of the night with 2:28 left to push the advantage to 61-51. Like two of their recent three games, though, the Yellow Jackets gave up a big run late. The Redskins finished the last 2:14 with a 10-4 run to cut down the final gap. Wapakoneta scored six straight points in the final minute and pulled within 63-61 on a basket by Adam Scott with four seconds left. Gordon made two free throws with 3.2 seconds left to ice the win. Scott led Wapakoneta with 31 points while Aaron Good added 11. 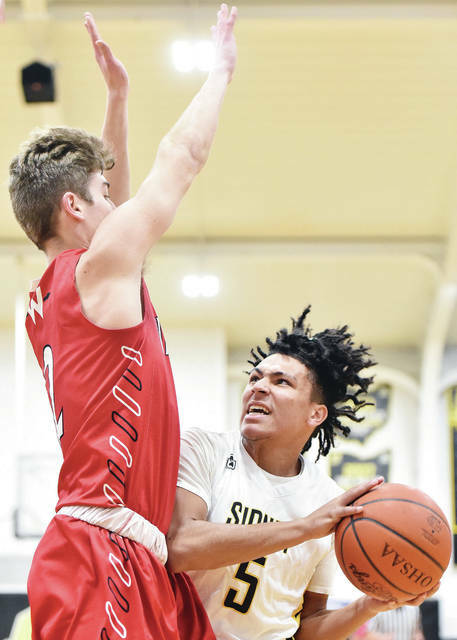 Darren Taborn finished with 10 for Sidney. Sidney jumped out to an early 15-2 lead but Wapakoneta battled back by halftime. Josiah Hudgins made a free throw with 4:10 left in the first to put the Yellow Jackets ahead by 13, but Aaron Good made a 3 for Wapakoneta with 36 seconds left to cut the gap to 21-11 by the end of the quarter. Gordon opened the second quarter with a layup and a dunk in the first minute to boost the lead to 25-11, but the Redskins responded with a 7-0 run over the next 90 seconds. 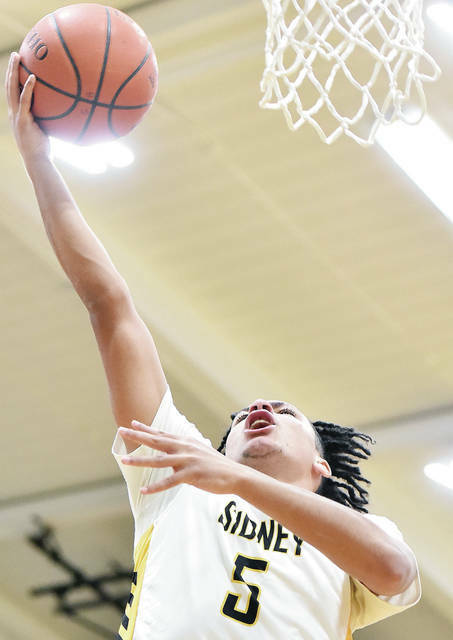 Gordon had his third dunk of the night with 3:38 left to put Sidney ahead 28-20, but Wapakoneta finished on a 7-4 run to pull within five points by halftime. Gordon entered high school with a lot of hype surrounding him after a stellar middle school career and success on the AAU circuit. 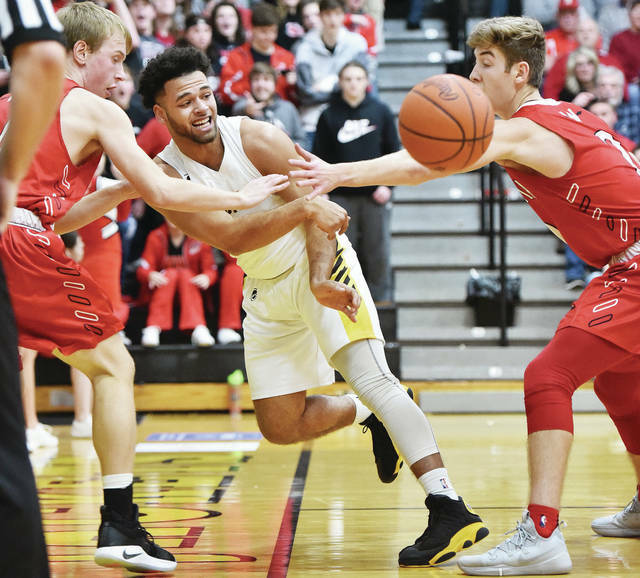 Gordon has two big things left on his agenda he hopes to accomplish: helping Sidney win a third straight GWOC American North title and a district championship. 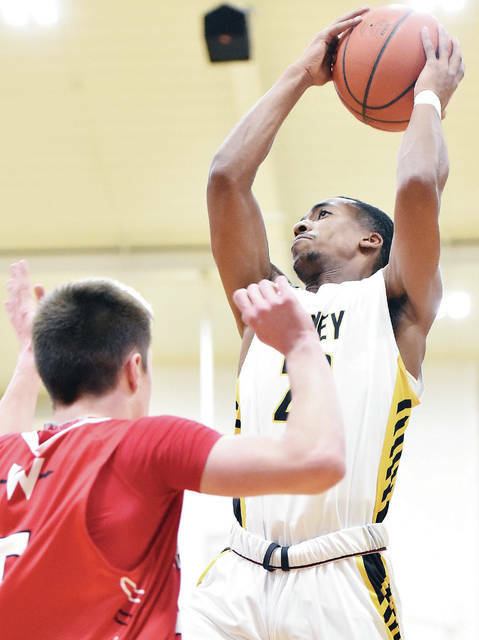 The Yellow Jackets will get back to work on the former on Tuesday when they host Tippecanoe. Sidney and Butler are tied atop the GWOC North with 8-2 records. Gordon said one thing will be key in the team’s title race the next few weeks. “We can’t come out and play to the level of competition; we’ve got to play above the level of competition,” Gordon said. “When we played Trotwood (last Friday), we played them like they were the best team in the nation. But when we play like a Greenville or a team that’s struggling, we play to the level of competition. Sidney’s Jace Conrad tries to keep the ball inbounds as Wapakoneta’s Aaron Good defends during a nonconference game on Monday in Sidney. Sidney’s Lathan Jones puts pressure on Wapakoneta’s Noah Ambos during a nonconference game on Monday in Sidney. 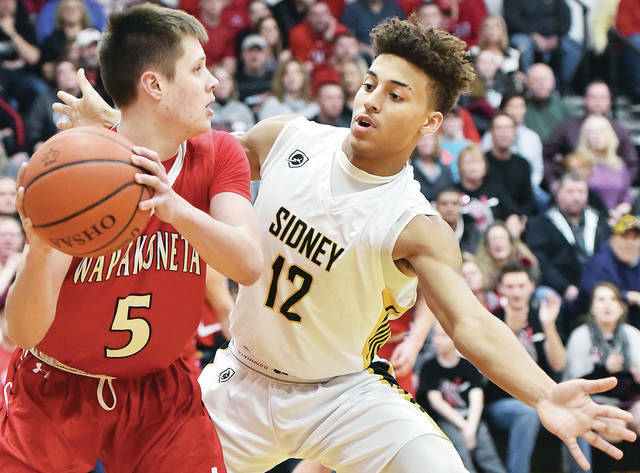 Sidney’s Darren Taborn looks to get around Wapakoneta’s Aaron Good during a nonconference game against Wapakoneta on Monday in Sidney. Sidney’s Josiah Hudgins shoots as Wapakoneta’s Noah Ambos defends during a nonconference game against Wapakoneta on Monday in Sidney. Sidney’s Darren Taborn scores a layup during a nonconference game against Wapakoneta on Monday in Sidney. Sidney’s Andre Gordon dunks during a nonconference game against Wapakoneta on Monday in Sidney. Sidney’s Andre Gordon puts the ball between his legs during a dunk attempt during a nonconference game against Wapakoneta on Monday in Sidney. 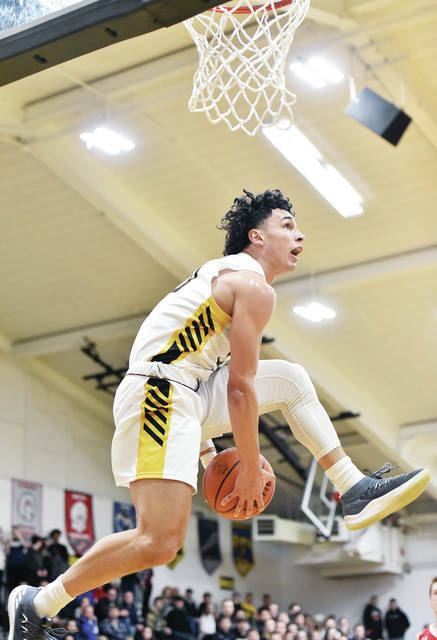 This entry was tagged Andre Gordon, basketball, boys, boys basketball, career, Greater Western Ohio Conference, GWOC, high school, John Willoughby, leader, photo, photos, picture, pictures, points, Ratez Roberts, rebound, rebounds, record, Redskins, result, score, scoring record, Sidney, statistics, stats, Wapakoneta, WBL, Western Buckeye League, who won, Yellow Jackets. Bookmark the permalink.